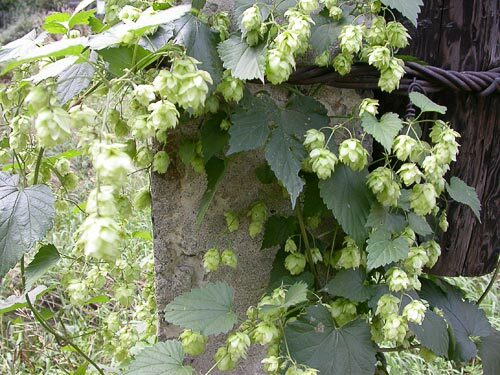 AgroAtlas - Relatives - Humulus lupulus L. - Common hop. Family: Cannabaceae Endl. ; genus: Humulus L.
Perennial dioecious plant. Stem is climbing, quadriacies, up to 5 (7) m length. Leaves are opposite, 1,5-7 (10) cm length, with long petiole, spherical-ovate or ovate, with deeply cordate base, 3-5-lobed up to their middle part (upper leaves can be entire), rough from above, glabrous from below, with long prickly denticles 5-12 (15) mm length and the same width along the edge. Male flowers are in racemes, 2-4 (7) mm in diameter, perianth lobes are 2,5-3,5 mm length. Female flowers are gathered to capitate inflorescence. Bracts (glumes) of female flowers up to 1,5 cm length, are tunicate, entire; they grow thick when fruits mature, and cover fruits-nutlets, making collective .cone. fruit, (1,5)3-4 cm length, 2-3,5 cm width; there are 1-3 .cones. on the stem. Nutlet is 3-4 mm length, 3-4 mm width, flattened. The species is in culture, it invases and get wild easy, that.s why the natural area is not clear. Blossoms in June-July; bears fruit in August. General distribution: Europe, Asia, Northern America. Within the ex-USSR territory: European part - central and southern regions, Ante-Caucasus , Western Siberia, Far East (rare) - Zeia Lower, Ussurijsky and South-Sakhalinsky regions. Valleys of rivers and brooks, wet shadow places. Can be founded in the willows and alder thickets. Common hop .cones. are used in beer and bread producing. Medicinal plant - cones are used as in scientific, as in folk medicine. Inflorescences can be used for making of fabric dye-stuffs - green, red and brown colors and for making lacquers and printer.s ink. Stem is used for strong fibre producing, which can be used for making cord and sacking . In early spring time people use yang shoots, rich by vitamin C, for food. Ornamental plant, can be used for planting of vertical planes. Flora of the Central Siberia, 1979. Malyshev L.I., Peshkova G.A. (ed.). Novosibirsk: Nauka. Т.I, p. 271. (in Russian). Flora USSR, 1939. Vol. V. Komarov V.L. (ed.) M.-L.: Publishing House of Acad. Science, pp. 382-383. (in Russian). Galushko, A.I. 1978. Flora of Northern Caucasia. Vol.I. Rostov, Publishing house of Rostov State University, p. 198. (in Russian). Gubanov, I.A., Kiseleva, K.V., Novikov, B.S., Tihomirov, V.N. 2003. Illus. manual of the Middle Russia plants. Moscow, Vol.II, p. 39. Grossgeim, A.A. 1945. Flora of Caucasia. Baku, Publishing House of Azerbaijan Acad. Science, Vol. III, 311 p., appendix. (in Russian). Tsvelev, N.N. 2000. ManuaL of the vascular plants of North-West Russia (Leningrad, Pskov and Novgorod district). St.Petersburg, Publishing House of SPHFA, p. 410. (in Russian). Vascular plants of the Soviet Far East, 1988. Vol. 5. Harkevich S.S. (ed.). - Leningrad: Nauka, p. 123. Copyright on this picture belongs to Chukhina I.G.